This entry was posted on February 10, 2015 at 11:15 am and is filed under poetry, Uncategorized. You can subscribe via RSS 2.0 feed to this post's comments. I loved your poem today, after three snowstorms here in Boston–thank you for it! And I loved the photo, too, and looked up Gillettes to learn more. 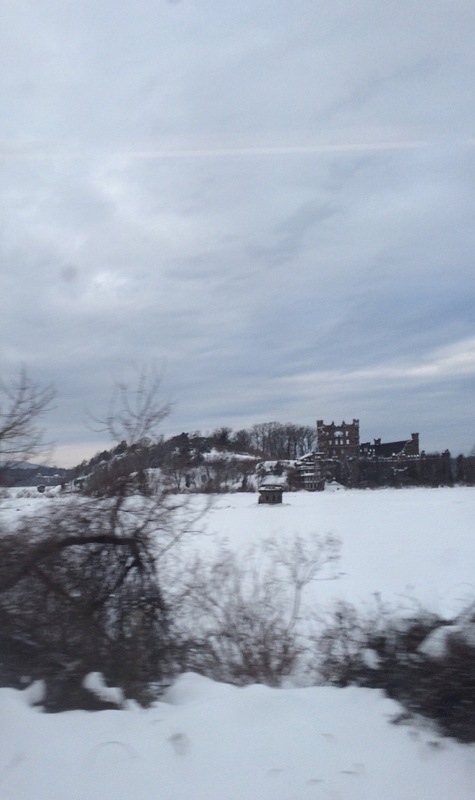 It turns out your island is Pollepel, with Bannerman Castle–Gillettes is up on the Conn River. Both places were fascinating to learn about! How are you? I was very sad to hear about Denise, and wonder how her (semi-adopted) son is doing in the wake of her death. I hope you and I can connect in spring, should it ever come — it would be great to talk! Thanks so very much. First–I am so very sorry also re Denise. It seems just impossible and impossibly sad. Second–yes!–the minute I read that Bannerman Castle I remembered! See what a sieve the brain is. Thank you so very much for your kind words. It is so great to hear from you, even with all this sadness in the background. I am so glad that I saw her again and that she seemed so well. k.
The trees in winter are so beautiful they are like thoughts in the way they paint the sky. I love that little detail about the socks.. sometimes there is so much more in those details than anywhere else.. Thanks, Bjorn–hope you are getting more light your side of the polar vortex! k.
Yes, I know what you mean! It is hard to start something new always, but hard to return to the old. You do a great job, Brian. k.
Ha! Mind-melt for sure! Hi, Amy. So nice to e-see you! k.
Is it age or the age that flattens and speeds our impressions so that we only have fleeting glimpses from a speeding window and sock-prints on our calves? Both, I suspect … Poems like there may be the only lake-surfaces we keep, where reflection intuits depth and depths defy death. I’ll take what little we can hold on to; you keep writing, I’ll keep writing too, OK? Ha. Thanks for your sweet comment, Brendan–a deal! k.
Your work with the visuals here is exquisite, k–the personification and the echoing of your own body to the way nature has clothed/ bound the landscape in snow really neatly done as well. ‘when what I need for a mind is a lake’–that is just genius, and the whole stanza that follows, all could be quoted back and savored, but then I would want to do the rest of the poem too. ;_) Beautiful writing, bringing the mind’s dark mirror up to reflect the winter light. This is just an amazing poem to read. The lines flow from thought to thought in a most poetic way, filled with authenticity. I love the description of the snow clad landscape, the metaphor of clothing is excellent. Thanks so much, Kerry. k.
I know this feeling (alas, and sigh). As we get older we process impressions differently than when we were very young, and everything was new, but I seem to recall reading somewhere that neuroscience teaches that all our impressions connect with lightning speed to pathways in our brain connected to memories. So don’t worry, your brain is still hard at work! That’s not how it feels sometimes, though, and your poem brings the reader to an intimate point of contact with such a feeling. No other art form can do this sort of thing as well. p.s. I like your use of the out of focus image. Thanks, it is taken from the train, and I think on some browsers the more in focus part–the little castle–may not show up. The train windows are also not so clean! k.
Thank you, Margaret–I am glad to hear that it only took a few minutes of happy hour to get you re-invigorated. This is why you have five children or six! Great energy! k.
I love you descriptions of the trees and how they are clothed, the lake and all it hold/reflects, the ridges from your socks echoing the texture of bark… beautiful writing! OH Karin, I love this, I relate fully to this! And love the knee-sock ridge metaphor, oh how I get that. Love, love! I will meet you at Gillette Castle one day!!! Wanna? Have you been? We went for the first time this past summer and we all loved it. Certain to be an annual (at least) destination. It’s sooo wonderful in its beauty and grand eccentricity. oh my god. just a scribble you say? This is wonderful and rich, so much gorgeous imagery that belies your early claim of not being imprinted, having nothing to say. If you decide to edit this, please do it carefully because it’s honestly one of the most lovely things I’ve read in a long time. Ha–David, you are so very kind. I certainly did start out rather emptied, but then I did think of a lake I knew! You are super sweet and that is much appreciated. K.